Women who are tired of wearing uncomfortable shoes for the sake of style can get relief; it has arrived with the creation of gorgeous shoe designs that are actually comfortable to wear. If you are looking to upgrade your closet with comfortable shoes to slip on and wear day or night, there are endless options available. Designed with modern stylish flair and the brand's patented N5 Contour technology, the Naturalizer Michelle Pump supports the foot with comfort and flexibility. This shoe style has a cushioned footbed and arch and heel support to maintain comfort. Available in a range of 16 colors, and textures such as suede and leather (and one floral print), this classic shoe design comes in sizes 6 1/2 - 9, and costs about $90. 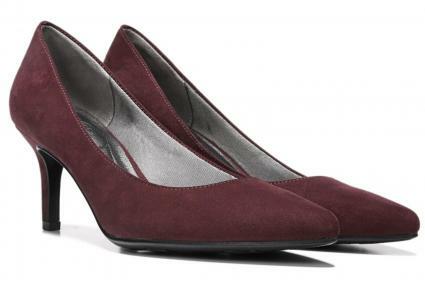 Purewow.com is fond of the Naturalizer Michelle Pump's heel height and aesthetic appeal. When it comes to timeless style, Michael Michael Kors is a designer that comes to mind for many fashion enthusiasts. It should come as no surprise that the Flex Pump is among one of the most fabulous comfort shoes that exist. The leather shoes are designed with a padded footbed and rubber sole. This shoe style costs about $110 and comes in black in sizes 5 - 11. 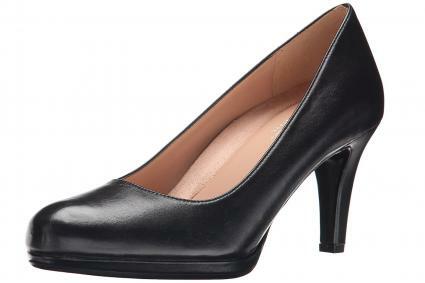 Rank and Style lists the Michael Michael Kors Flex Pumps as #1 among comfortable work shoes. There are times when a dainty outfit calls for a sweet and simple shoe design. 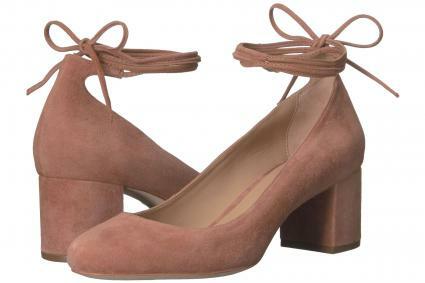 The Clara Ankle-Tie Pumps by Loeffler Randall are made of suede and ties at the ankle. 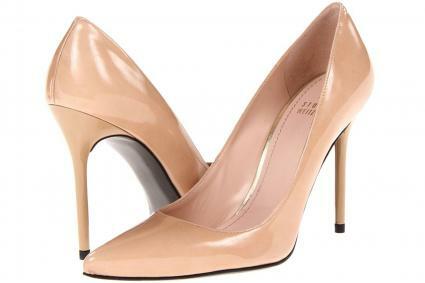 Available in neutrals such as black and blush, this shoe style costs around $325 in sizes 5 - 11 1/2. The designer shoe brand is one that takes pride in creating stylish shoes that doesn't compromise a woman's comfort. Listed by Washingtonian.com as a top podiatrist-approved shoe, the rounded toe of the Loeffler Randall Clara Ankle-Tie Pump prevents toes from being cramped as you walk. Whether for a day at work, or a night of partying, the Women's Sevyn by LifeStride will keep your foot wrapped in comfort. The shoes are made with a soft-system comfort package ensuring all-day support, flexibility, and cushioning. With six colors and one floral print to choose from, these shoes cost around $60 and are available in sizes 5 - 11. 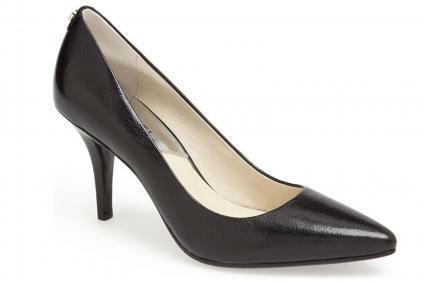 Woman's Day recommends the Sevyn by LifeStride as a little-black-comfort-pump must-have. One shoe brand that is synonymous with timeless luxury is Stuart Weitzman. The comfort of the Nouveau Heel will make your heart flutter even more. Made with a lightly padded footbed, the leather heel shoe style comes in six colors and costs just under $200 (available in sizes 4 - 11). This shoe style is the perfect basic for any outfit imaginable that you would want to create. Glamour.com listed the Stuart Weitzman Nouveau Heel as one of the most raved about shoes from women. As a podiatric surgeon and a shoe lover, Marion Parke launched her namesake collection to bring together the two worlds of style and wearability. Made in Italy, the luxury shoe designer shared with Forbes.com that the Mitchell shoe is among the top three sellers of her brand. The shoes are crafted with a patent-pending insole, arch support that distributes weight evenly, and added material to support the rear foot and ankle. The shoe is available in seven colors, in sizes 5 - 11, and costs about $650. Shoe designer and celebrity fashion stylist Neil J. Rodgers has always loved most getting the right shoes for stars such as Beyoncé and Giselle Bundchen. Now, he designs them. Among the styles within his collection are the Cecilia shoes, which are made with foam rubber cushioning and a toe bed that disperses the pressure in the front while walking. The sleek heels cost jut under $700 and run in sizes 6 - 11, however, the designer notes that the shoes run small and suggests that women select a half size up. Instyle.com likened the Cecilia heels feel to Asics running shoes. Women looking for modern and classic pumps will find comfort in the Penny pump by Corso Como. The leather shoe has a padded footbed to keep your feet fierce and cozy throughout the day. They are available in five colors in sizes 7 - 11, for around $60. 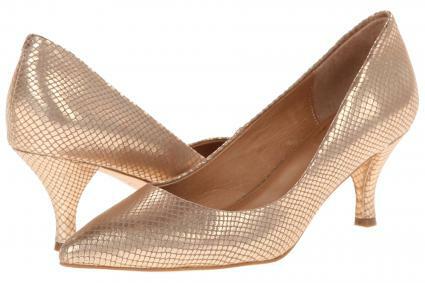 People.com suggests that the Corso Como Penny pumps are a game changer in comfort shoes, and provide all day comfort. According to Mercola Fitness, close to half of US women wear high heels, even though a large percentage say the shoes hurt their feet (as surveyed by the American Podiatric Medical Association). If painful feet have you tossing your beloved heels aside, perhaps you should consider shopping for shoes you will enjoy wearing. Here are a few tips and suggestions to help you navigate your next shoe shopping trip for comfortable options. Purchasing shoes that are the wrong size can work against a woman's feet and keep her from experiencing a true sense of comfort. Often times our diets, workout routines and lifestyle changes (such as gaining weight or becoming pregnant) can also lead to feet swelling, which can also have an effect on a shoe size. Even if you have been wearing a particular shoe size for awhile, it can never hurt to get them measured. Whether you are shopping for pumps, chunky heels or wedges, look for shoe designs that have design features and elements of the shoes listed above. Designs that include toe padding and cushioned arch support will provide comfort and prevent shock when feet hit the pavement while wearing shoes. Shopping for shoes is most effective when you know where to go for what you are looking for to complement your lifestyle needs. Here are a few more shoe manufacturers that focus on the comfort of your feet. Since 1930, Dr. Scholl's shoes has been manufacturing comfortable shoes focusing on the best care of women's feet. From wedges to work pumps to ballet flats, many of Dr. Scholl's shoes are made of memory foam. Padded shoes are available in a range of styles costing around $40 - $90. Aerosoles shoes are made with padded foam insoles, breathable footbeds, and protected on the bottom of the shoe with a diamond-flex sole. Here you can find sandals, casual canvas shoes, and pumps. One unique feature of Aerosole heels is the patent-pending heel-rest technology to distribute body weight towards your heels as opposed to your toes. Shoe styles from Aerosoles cost around $40 - $100. If you want comfort shoes customized only for you, then you may want to consider Solely Original. From the comfort of your living room, you can find your perfect fit using the company's 3D fitting sock and foot scanner or by simply selecting a standard size. With 12 styles to choose from for a customized shoe design, prices of Solely Original start around $110 and give you comfort, style, and customization. Now that you have a comprehensive list of shoe brands that offer design to keep your feet comfortable and stylish, you'll never have to walk in pain again. No matter your budget, the occasion, or an outfit look that you want to pull off, there is a comfortable pump you can wear without compromising your style.